One chance meeting and Carter changes his future. He doesn’t understand the reason; he just knows he has to be by Carmen’s side. Carmen doesn’t understand why she can’t say no, she just knows she needs him. This has to be the most emotionally charged book I have read by KA Hobbs. The emotional roller coaster she takes you on is one you don’t see coming. Your heart will break in so many ways and for so many reasons. The tears will fall with sadness, with happiness and heartache. Their journey together is tough; one full of uncertainty yet so full of love and hope. 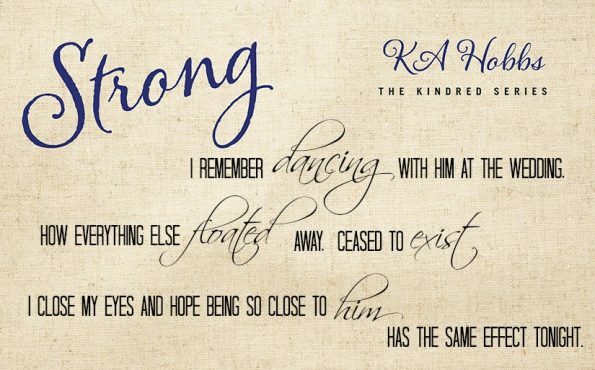 Uncertain if KA Hobbs has the ability to create another amazing book boyfriend? Then Strong is going to surprise you in all the best ways! I am so in love and in awe of Carter right now. He is a sweet, compassionate, dependable, caring and an unpredictably amazing man. He was willing to put his whole life on hold and change his path to be by Carmen’s side. He is an inspiration of strength, devotion and true love. Carmen was more than an inspiration for me, her strength to go through what she was and to still be smiling gave me a whole new perspective on life. We often take things for granted and with Carmen’s story she was a reminder we should always be thankful for what we have and how we have been blessed. She was also an inspiration of hope and encouragement for others who are or have been through what she has; encouragement that things will get better that you will come out on top and hope that the future is still there to be grabbed and had, that your dreams are not lost just found and achieved in other ways. This story has left me with a heart full of love and a strong compassion for those who go through what Carmen does. Their battle is a long one and one that they may never truly come to terms with, they simply have to live with and build on what they do have and find their own path to the future they both want and deserve. Other things I loved about this book is seeing the gang together, they are always full of laugh out loud moments and treat each other like family; they will go above and beyond to protect, care and help the others. Carter and Carmen have plenty of fun moments too, which gives the book the light hearted side it needs to break up the emotionally charged scenes. Without a doubt KA Hobbs has excelled once again with a brilliant, outstanding and fascinating story. Her writing style is captivating and easy to follow; she has the reader enthralled from the beginning and never fails to keep the reader absorbed in the story. 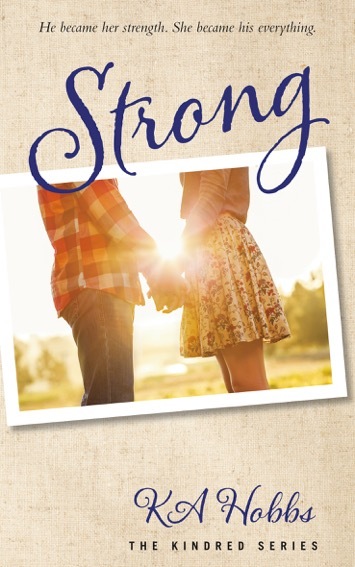 With Strong KA Hobbs has thrown in a new angle and left us with a cliff-hanger, however it suits Carmen and Carter’s journey because they still have so much to give and so much to tell us. I can’t wait to read more from Carter and Carmen. If you love romances that include real life circumstances, humour, suspense and a whole load of love, without a doubt you will absolutely love any/all of KA Hobb’s books.